As set out in Implementing the Five Year Forward View for Mental Health the expansion of Improving Access to Psychological Therapies (IAPT) services will focus on people with long term conditions or medically unexplained symptoms. New psychological therapy provision will see physical and mental health care provision co-located. Therapy will be integrated into existing medical pathways and services – either primary care, or secondary care services (eg diabetes, cardiac, respiratory). A consensus statement has been developed by national clinical leaders setting out the key characteristics of integrated IAPT services. NHS England is working to support new services. A competence framework for psychological interventions with people with persistent physical health problems. 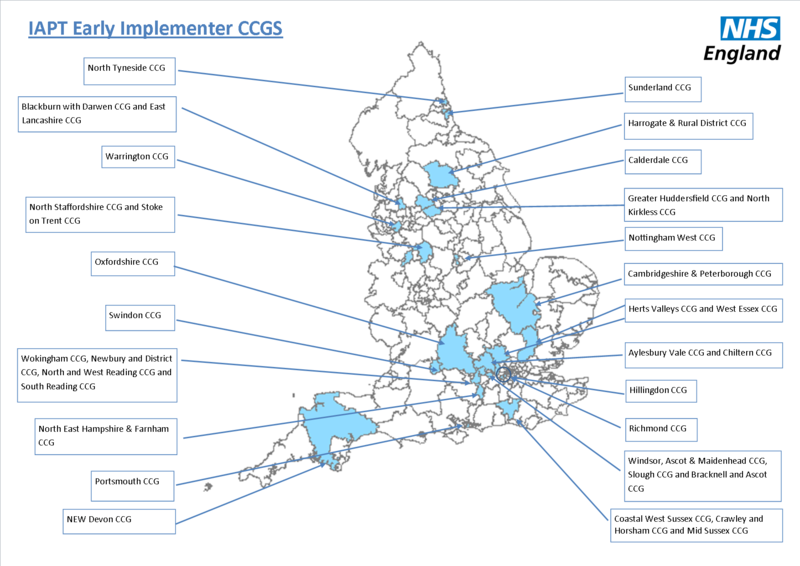 A map to show the locations of the wave one Integrated IAPT early implementers. These sites were launched in September 2016 and are supported by additional funding to develop mental health services within long term condition care pathways. Included in this wave are services for people with diabetes, respiratory, cardiac and medically unexplained conditions.